Sep 26, 2018, Muir Snowfield: Hiker Crevasse Fall! 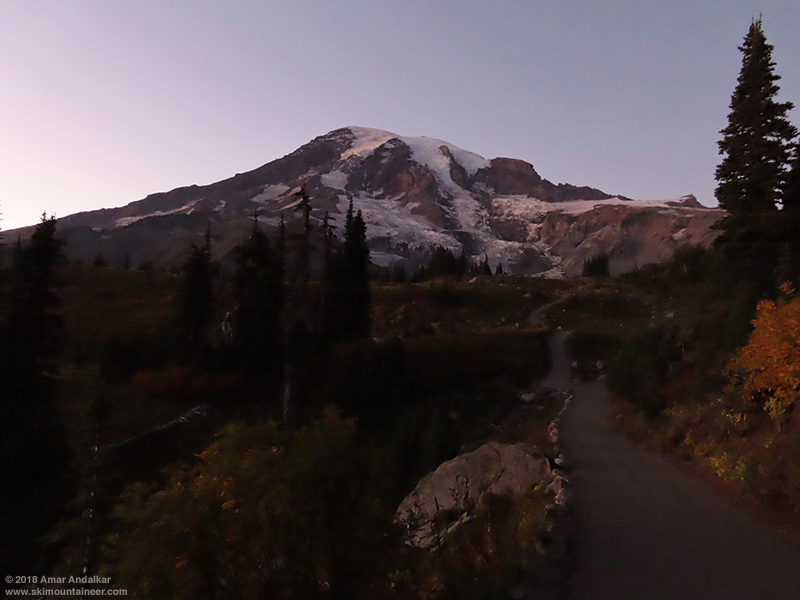 September 26, 2018, Mount Rainier, Muir Snowfield: Hiker Crevasse Fall and Rescue at 9380 ft! 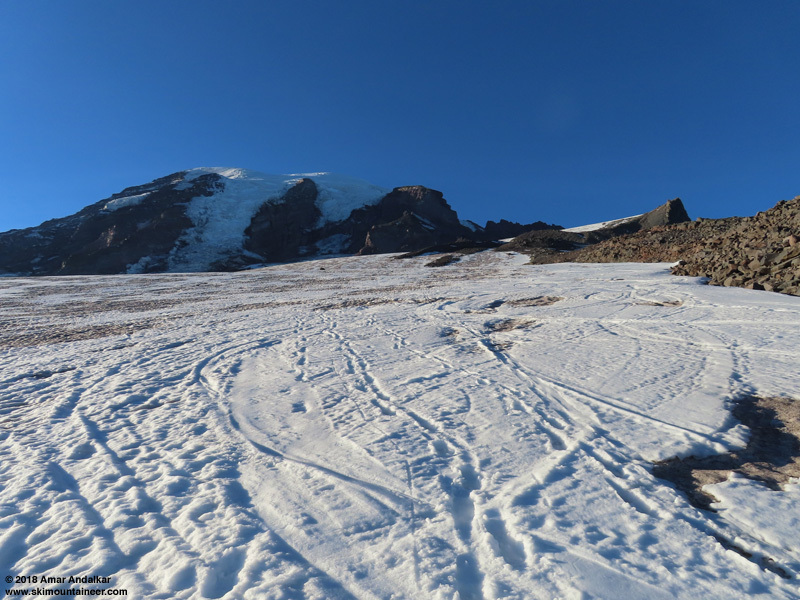 Skied the Muir Snowfield on Wednesday for the 4th time in the last 10 days (and my 328th time overall skiing from Camp Muir), since heavy end-of-summer snowfall brought excellent smooth ski conditions instead of the endless deep dirty suncups which had existed up there since the first week of July. Ski conditions still remained very good above 8200 ft as long as one stayed on the smoothest and deepest ribbons of recent snow, but had definitely deteriorated since my previous ski 2 days earlier on Monday, with almost all recent snow below 8200 ft now melted off to reveal the previous very dirty ash-covered surface. And even that Monday was nothing like the stellar ski conditions of the previous Monday-Tuesday, September 17-18, which had nearly 100% new snow coverage, 3-18" deep, all the way from Camp Muir down to the lower Pebble Creek roll at 7280 ft -- just outstanding smooth snow conditions for September, or even any month up there. The ongoing Indian Summer heat wave this week with freezing levels of 14000-16000 ft is rapidly melting the recent new snow, and ski conditions are deteriorating day by day. 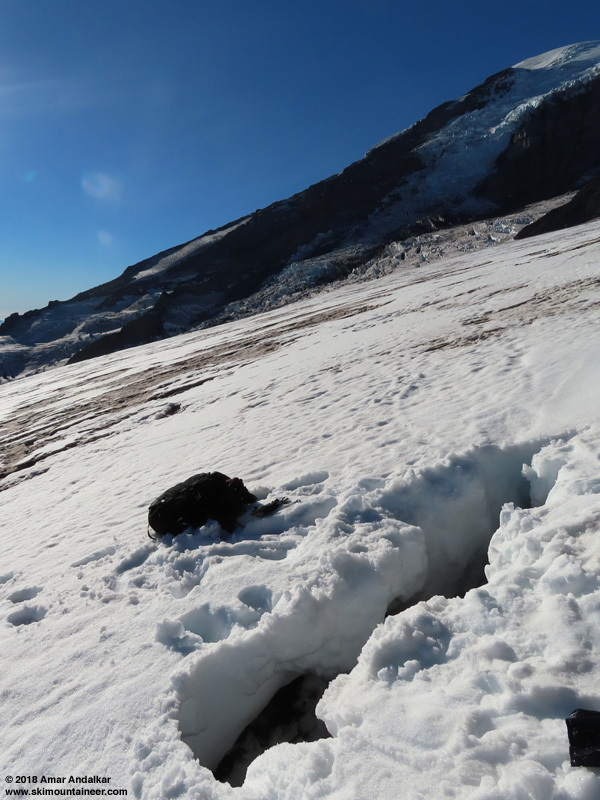 But of much more significance is that dangerous crevasses are opening on the Muir Snowfield, and the 1-2 ft thick bridges of recent snow across them will not support the weight of a hiker, or even a skier if you happen to pass over the crack lengthwise. Serious falls with major injuries are likely if you unwarily put your weight onto these suspect areas, and even fatalities due to hypothermia inside the dripping wet, 32 °F crevasses are a very real possibility if you are unable to somehow extricate yourself quickly enough or summon outside help. Despite its name, the Muir "Snowfield" is actually a very real glacier, cored entirely with blue glacial ice above 8500 ft, and riddled with a few dozen crevasses of mostly quite small size (by normal glacial standards) -- but even those small crevasses can open large enough to fall completely into, well over head-deep and with serious injuries during the fall. Yesterday I assisted with the rescue of a pair of hikers who had fallen into such a crevasse at about 9380 ft elevation, just north of and about 150 vertical ft above the top of Moon Rocks, a glacial moraine of the formerly-thicker Muir Glacier. I had skinned up past that same area around 3pm, even taking a scenic detour up to the top of Moon Rocks for some unknown reason to shoot a few photos and panoramas (normally I skin right by there well to the west of Moon Rocks without ever stopping). There was no obvious sign of any crevasses at all anywhere nearby, and I skinned up in a leisurely angling and switchbacking course above Moon Rocks, following the smoother snow and avoiding the stampede path of boot tracks. I would guess that I passed within perhaps 100 ft of the later accident site without noticing any sign of a crevasse. Anyway back to the story: just as I was about to head back over to my skis and ski down, I overheard that there was a rescue needed for some hikers who had fallen and were injured and hypothermic on the Muir Snowfield. The climbing rangers are no longer staffing Camp Muir regularly since last week, so the only park staff at Muir was Rich, the maintenance guy. He was on the park radio with dispatch, and trying to organize an impromptu rescue effort heading down from Muir, while other rangers were being called in to head up from Paradise too (although they would need a few hours to get to the accident site). Luckily there were 2 park rangers from Glacier National Park who had summited Rainier earlier in the day and were still hanging out at Muir, so Rich recruited them to assist him in the rescue. And I offered to help too, especially since I was on skis and could get down to the accident site very quickly, versus the 3 of them on foot. 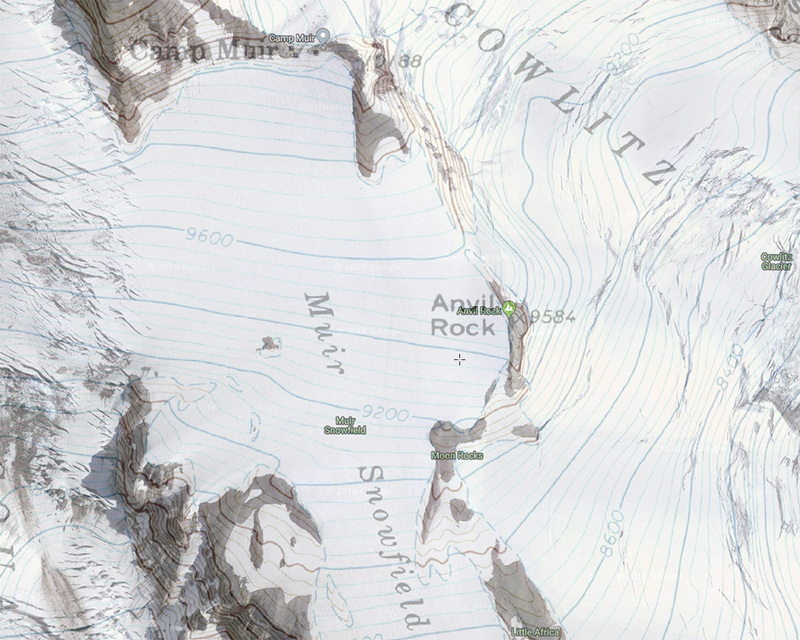 The only info we got over the radio was that the hikers were injured and hypothermic, along with GPS coordinates and an approximate location of "9500 ft below Anvil Rock" -- but no mention of any crevasse fall at all, not that any of the 4 of us would-be rescuers heard. Sometimes, wires get crossed when relaying all the critical info via radio during a rescue, and crucial details can get lost in transit, which appears to be the case here. Rich gave me a park service stuff-sack with a large down jacket and pants for the hypothermic hikers (the only extra bulky clothing I could fit in my normally very full 35L daypack), and I skied down just before 5pm. Ski conditions were still good along the left edge, and within a couple minutes I came over the roll west of Anvil Rock and spotted the 2 hikers sitting on the snow. They quickly noticed me and got up and started waving. But as I got closer I was shocked to see a large dark opening in the snow just a few feet west of them, maybe 2-3 feet wide and 10 feet long -- it was very obviously a crevasse! Luckily I was already coming in from the correct (non-crevasse) side towards them. The 2 victims (28 yo female, 30 yo male, both from New Jersey) were soaking wet and shivering, despite the strong sunshine and very warm temps in the 50s °F. She had a dislocated shoulder and was missing 1 shoe, but luckily both were ambulatory with no leg injuries. I quickly checked on their condition and gave them the park's down gear, along with my own emergency down jacket and synthetic puffy, and assured them that 3 more rescuers were on their way down from Camp Muir. They were only maybe 100 ft east of the main stampede path, but there were plenty of boot tracks all around there too -- they were well within the normal area that people hike up towards Camp Muir from Moon Rocks. As the 2 shivering hikers warmed up, I heard details of their story: She had been walking about 30-40 ft in front of him when she suddenly plunged through the snow and disappeared into the crevasse. He rushed up to help her and fell into the same crevasse too. So they were both inside the crack, over head deep, with meltwater pouring down onto them! Somehow, they then managed to crawl out of the crevasse with no outside assistance at all, which was pretty amazing to me. He boosted her up, and she clawed and crawled out, and somehow he got himself out of there too, despite the slick ice walls inside it. And despite their inexperience in the alpine environment (they were on a road trip to visit and hike in various national parks in all 50 states, or some such thing), they were very well prepared compared to many hikers (and skiers!!) that head up to Muir with totally inadequate clothing and gear. Each carried a pack with extra clothing, socks, food, etc (they said they had recently bought a lot of stuff at REI! ), and they were carrying a satellite phone (borrowed from a friend for their trip), which they had used to call 911 and be connected to park dispatch after they miraculously self-rescued out of the crevasse. I actually had solid cell service at the accident site too, as Verizon now has very good cell coverage above 7000 ft on the route to Muir, so I was able to call in to park dispatch as requested and update dispatch on their condition. The crevasse opening with the pack beyond. In addition to the 2 of them being soaking wet and shivering when I arrived on the scene (but otherwise in good condition), both were terrified to move at all in any direction, even a few feet, for fear of falling into a crevasse again. His pack was lying on the other side of the open crevasse, and they had no way to get it in their current state. I checked out the crevasse from the side, and it looked to be only about 3 ft wide, so I knew I could safely bridge across it on skis and get the pack, which had urgently needed clothing, dry socks, etc. I quickly skied across the crevasse in a safe-looking spot maybe 6-8 ft below the opening, and then back again to the other side with their pack. I got a pretty good look into the crack while crossing it twice, but didn't stop atop it to shoot a really good photo looking directly up the length of the crevasse, so the previous one is the best view of the crevasse opening that I have. The crevasse appeared to be about 3 ft wide near the surface and maybe 8 ft deep where the hole was. It extended uphill (angling leftward somewhat) at least 100 yards, and I could see 2-3 more openings along it farther uphill, but it did not extend nearly as far downhill from the site, maybe only 10-20 yards. Overall, a fairly substantial crevasse by Muir "Snowfield" standards. Some years by September, there are several such open crevasses in the region above Moon Rocks up to about 9600 ft, and also several more extending diagonally across the western part of the "Snowfield" closer to the much larger crevasses of the Nisqually Glacier itself. Some years, there are multiple crevasse falls and rescues on the "Snowfield" during late summer and early fall, in particular I recall that 2014 (or was it 2013?) had maybe a half-dozen such incidents, several of which I heard of from the climbing rangers while chatting with them at Muir that year. Given that the two of them were now in good hands and starting to walk downhill with the 3 other rescuers, with 2 more rangers also heading uphill from Paradise to meet them, it was time for me to depart and ski down while the sun was still shining on the snow, before it refroze into an unskiable surface. Skied down from the accident site at 5:45pm, thankfully the snow was still soft and skied nicely enough, even though sunset was just over an hour away. I stopped and waited a couple of times to look uphill, just to make sure they were all still moving downhill, but then eventually had to take off far ahead and out of sight. The end of the decent recent snow near 8200 ft.
Below 8200 ft, the snow conditions worsened substantially as all remaining recent snow had melted off, even along the edge, leaving only a very gritty ash-covered surface. At least it was mostly smooth and not suncupped at all. Very glad to have my rock skis for this part, as usual for almost all my September skiing. The very dirty older snow near 7500 ft.
Skied down to 7280 ft at the bottom of the lower Pebble Creek roll, with 2 short carries needed, one near 8100 ft and the other near 7350 ft. Rinsed off my very dirty skis and ski boots in the crisp cold water of the Creek right where it flowed out from under the permanent snow, and watched the 2 rangers heading upward pass by at 6:25pm as I was packing up to hike down. The 2.5 mile and 1900 vertical foot hike down went faster than on Monday or either day last week, perhaps fueled by my relief that everyone was OK in what could have been a very bad situation. Enjoyed a lovely sunset just before 7pm as I hiked down past Panorama Point and Glacier Vista. Back to the car just before 7:30pm, with still just barely enough twilight to not need a headlamp. And very glad to have been able to help out the 2 hikers in need. This was my 333rd time going up to Camp Muir since 1996 (all but 5 of those on skis), and the first time I had been involved in helping with any search and rescue effort up there. Re: Sep 26, 2018, Muir Snowfield: Hiker Crevasse Fall! Several factors contributed to the good outcome of this incident, some of them purely lucky and others not so at all. Chief among the latter set was the remarkable ability of this inexperienced party to self-rescue themselves from the crevasse, which had to have just been determination and adrenaline. And obviously they had made an effort to properly prepare themselves for the alpine environment of Rainier, by buying and carrying appropriate gear for the climb to Muir. And even gear that most would consider excessive for that route, such as a satellite phone, proved to be of great importance. The largest element of luck in their favor was that the crevasse they fell into was of only modest depth, maybe 8 ft, with a solid floor. According to the longtime park ranger and former climbing ranger who was incident commander for this search-and-rescue, when he first heard the call from dispatch (the victims had clearly told dispatch that they had fallen into a crevasse, even though that info did not reach us up at Muir), based on what he knew of the crevasses on the Muir Snowfield, he assumed the crevasse might have been as deep as 20 ft. If they had actually fallen into one 20 ft deep, there is very little chance they would have been able to self rescue from it with the hiking gear they had. And even if they had been able to get a satellite phone call out at all from inside the crevasse, they likely would have been critically hypothermic by the time rescuers had arrived and been able to get them out -- especially so with the lack of climbing rangers on duty at Muir this late in the season. Another major element of luck was the unusually warm, calm, and sunny weather. 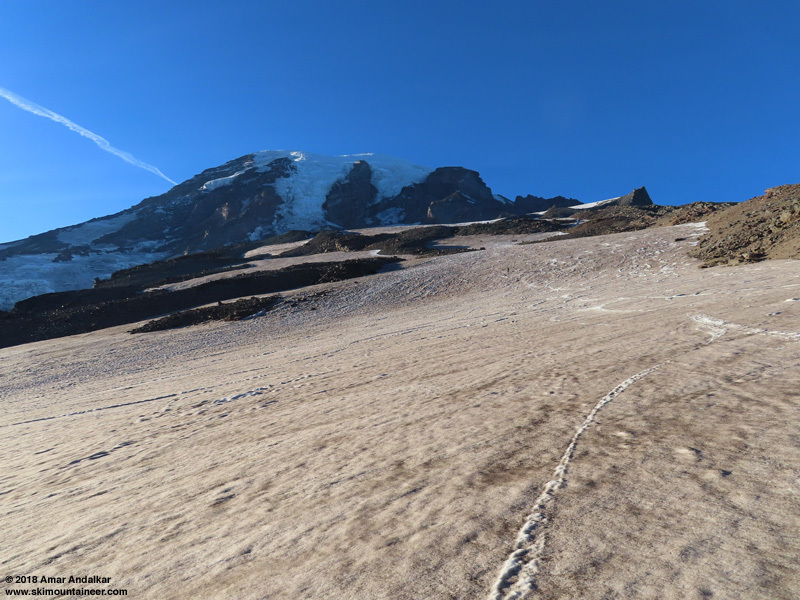 A freezing level over 15000 ft with temps in the mid-upper 50s °F at Camp Muir would be fairly warm even for July, and is highly unusual for late September. If temps had been in the 30s with a moderate breeze like on Monday, another mostly sunny day, the 2 of them would definitely have been in a much worse situation after getting out of the crevasse soaking wet. They almost certainly would have been severely hypothermic by the time we arrived from Muir, all else being equal. The NWS Rainier forecast from Monday for this week is shown below, along with the NWAC telemetry for Paradise and Camp Muir from Monday to Wednesday. Sometimes you need a combination of all these factors to be in your favor so that you end up walking out on your own power from a potentially disastrous or fatal situation, instead of ending up as a statistic. Please everyone, be extra careful and vigilant on the Muir "Snowfield" this time of year when crevasses are often a very real danger. SYNOPSIS...Upper level ridge centered offshore will build into the park Monday through Wednesday. The ridge will slowly weaken late in the week with a weather system moving into the area Sunday. IMPACTS...Strong winds near the summit will make it difficult to move safely and could produce local whiteout conditions Monday. A high level of skill and experience in alpine terrain, including use of GPS, is recommended for navigation and camping in these conditions. MONDAY...Sunny. Freezing level rising to near 10500 feet. MONDAY NIGHT...Clear. Freezing level near 12500 feet. TUESDAY...Sunny. Freezing level near 13000 feet. TUESDAY NIGHT...Mostly clear. Freezing level near 14500 feet. WEDNESDAY...Sunny. Freezing level near 15500 feet. WEDNESDAY NIGHT...Mostly clear. Freezing level near 15500 feet. THURSDAY...Sunny. Freezing level near 15500 feet. THURSDAY NIGHT...Mostly clear. Freezing level near 15000 feet. FRIDAY...Sunny. Freezing level near 14000 feet. FRIDAY NIGHT...Mostly clear. Freezing level near 11500 feet. SATURDAY...Mostly sunny. Freezing level near 9500 feet. SATURDAY NIGHT and SUNDAY...Mostly cloudy with a chance of showers. Snow level near 7000 feet lowering to 6000 feet on Sunday. GREAT work, Amar! They were very lucky to have you to assist them. Thanks, Amar! Thank you for taking the time to write this up, too -- it's apt to help future parties avoid the same experience. I haven't been up there since August, but there were a couple of crevasses that appeared as sags at roughly Amar's marked location. It was the earliest in any year (since ~2005) that I've seen sign of cracks in the Snowfield. Thanks! That is suprising to me. Glad it ended so well. Over the decade plus years of reading your trip reports, your writing is enjoyable plus the tables, maps and photos. 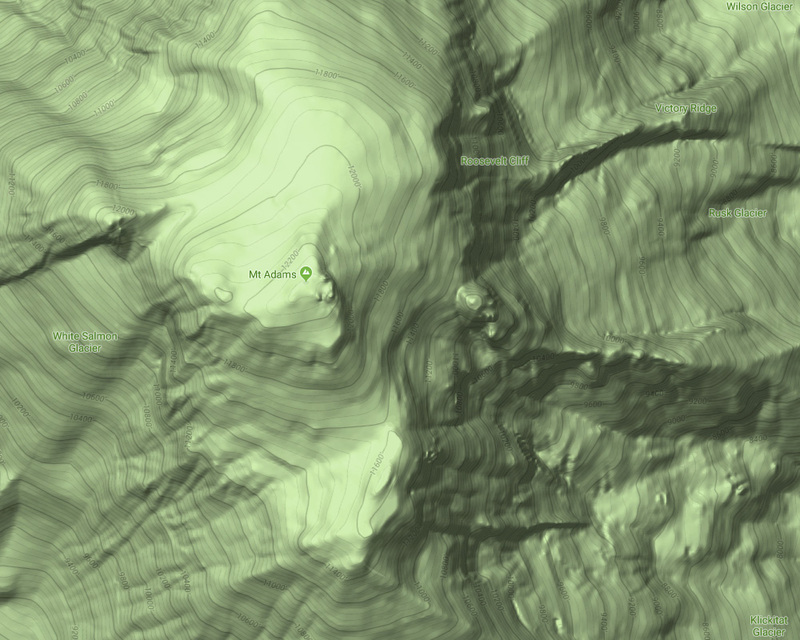 I recently realized that I should have included another map in the original post showing the crevasses on Muir Snowfield from the Google Maps Terrain layer. 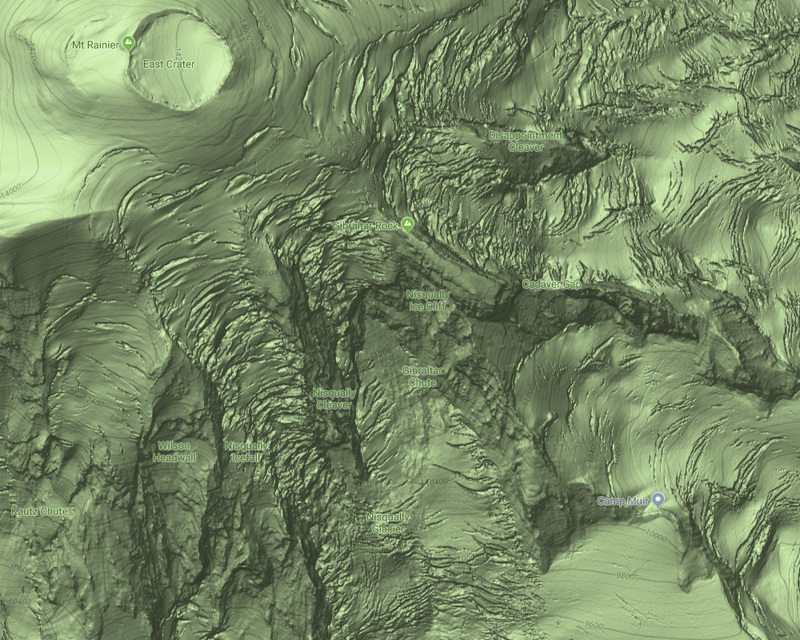 Starting a few years ago, Google Terrain has been updated with high-resolution lidar (light detection and ranging, using an airborne scanning laser) imagery covering many mountainous areas of the western United States. 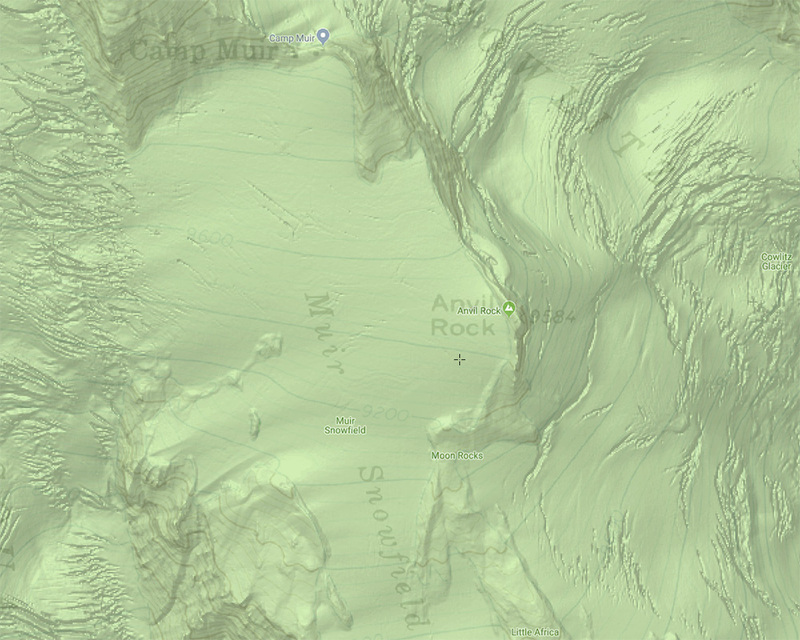 This easily shows crevasses and many other geologic features (rock glaciers, moraines, landslide debris, etc.) in very sharp detail. The increase in resolution is supposedly about a factor of 5, from a standard 10-meter DEM (digital elevation model) to the 2-meter lidar data, but the true increase in resolution appears to be even more than that, perhaps a factor of 10 or better. That is very cool -- thanks!